It's Memorial Day Weekend! Finally, a 3-day weekend to relax! 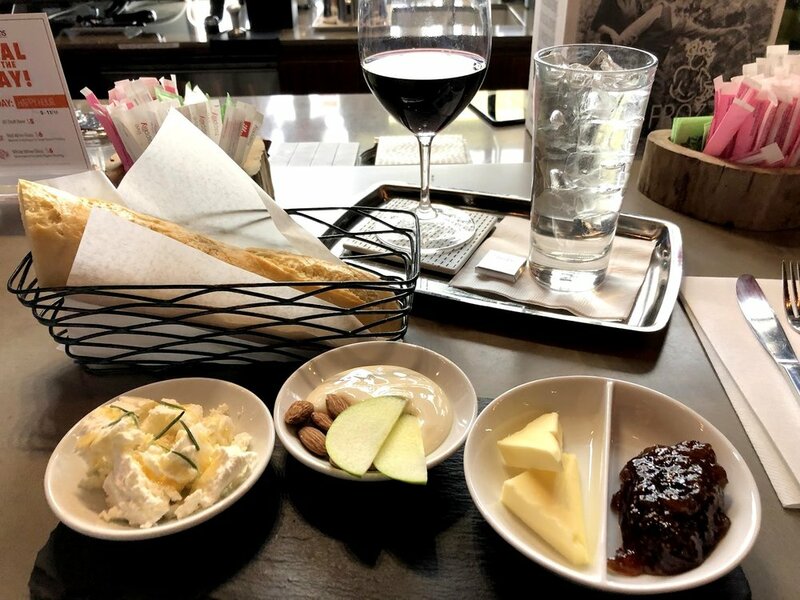 A really cool happy hour from 2Beans in NYC - a fruit and cheese platter and a glass of wine for less than $20! Mussels at Flex Mussels....on point. And do NOT get me started on their spectacular donuts. 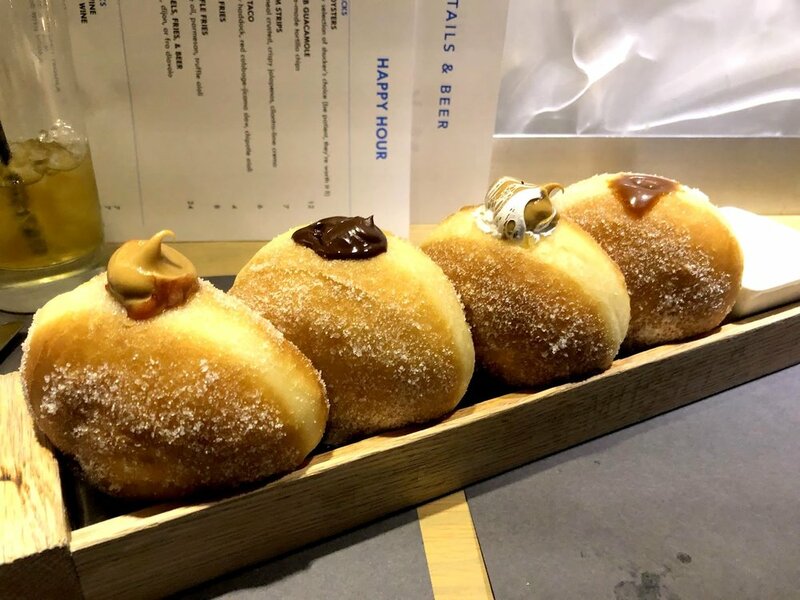 We got Peanut Butter & Jelly, Chocolate, Fluffernutter, and Salted Caramel. These are life-changing. That is all. Loving the brick, teal color, and chandeliers at Sorellina. Met Jessica Merchant from How Sweet Eats! She held a workshop at Word Bookstore in Williamsburg and we drank wine while making a sea salt hairspray and lip scrubs from her latest cookbook. Yes, from a cookbook! Don't mind my awkward stance below. She's so tiny and I was trying to do a bit of a squat...Nailed it! 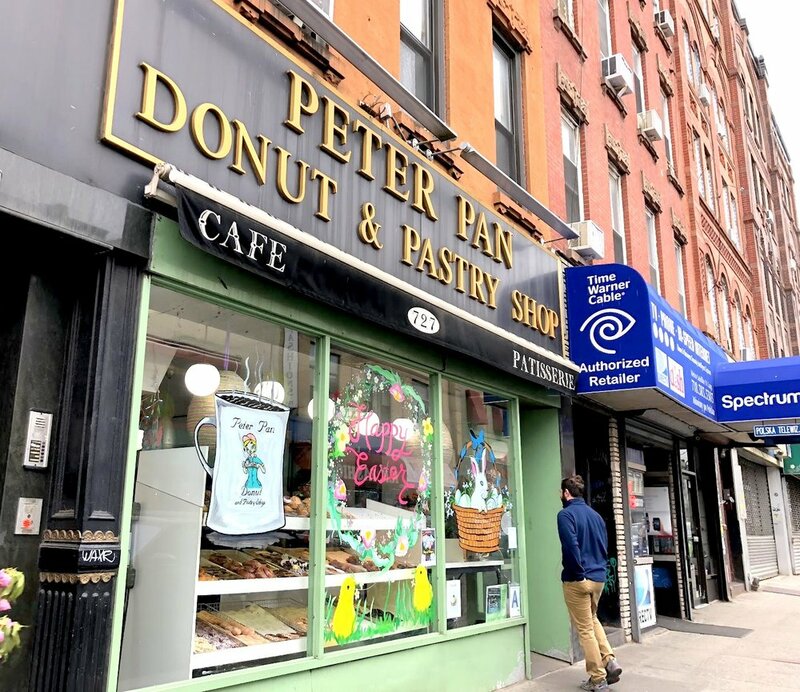 As I was leaving, I accidentally (on purpose) ran into Peter Pan Donuts. I may have purchased a few donuts to go. The fam came to visit and we went to The Ainsworth for dinner. I can't even explain how amazing these brussels sprouts taste! 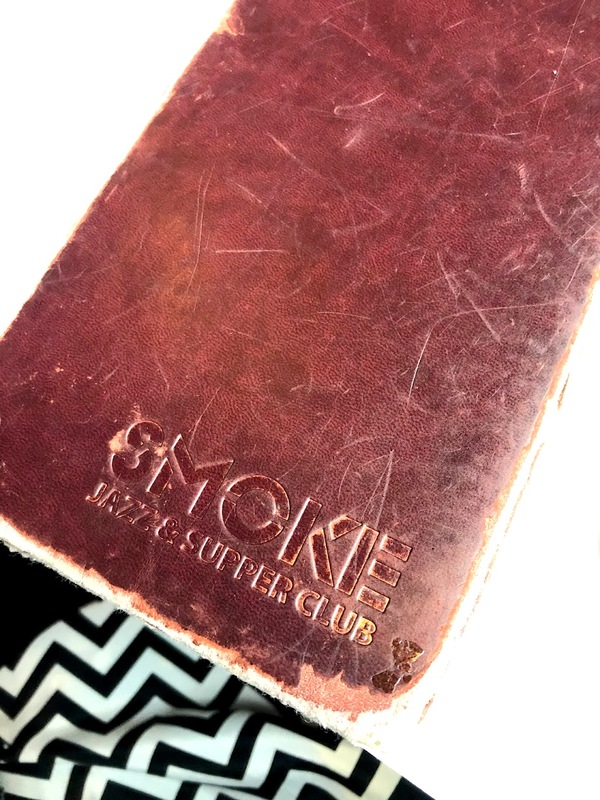 Drove into the city to catch Nicholas Payton at Smoke. He was fantastic! Post-brunch stroll through Brooklyn Botanic Gardens while the cherry blossoms were poppin'. Road trip up to Hudson Valley's Palaia Winery. 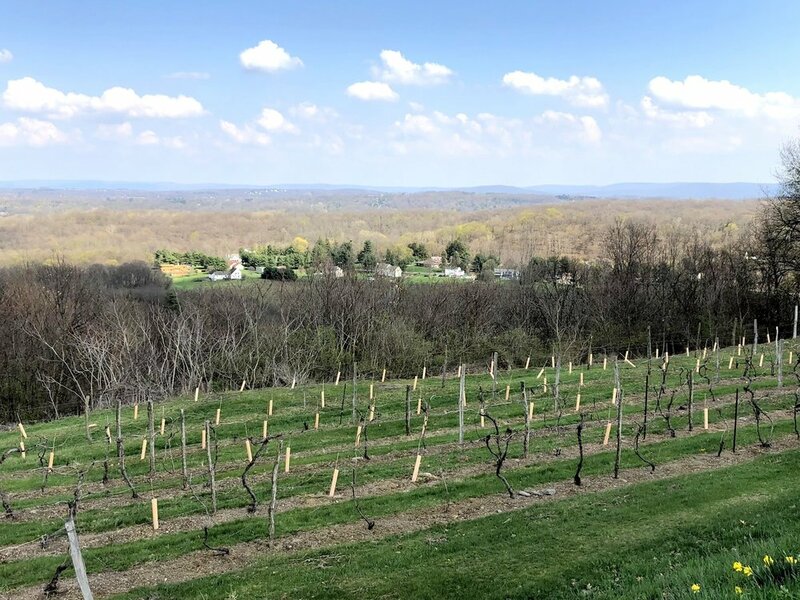 Beautiful views at Benmarl Winery. Took a tour of the Benmarl wine vault. So many dusty bottles! When college friends come to town, you brunch at L'Amico. I'm kinda sorta getting back into runninng. Foggy early morning views of the NYC skyline. I honestly can't get enough of shrimp and grits lately. Picked this up at Peaches. Speakeasy above a Five Guys restaurant in NYC. 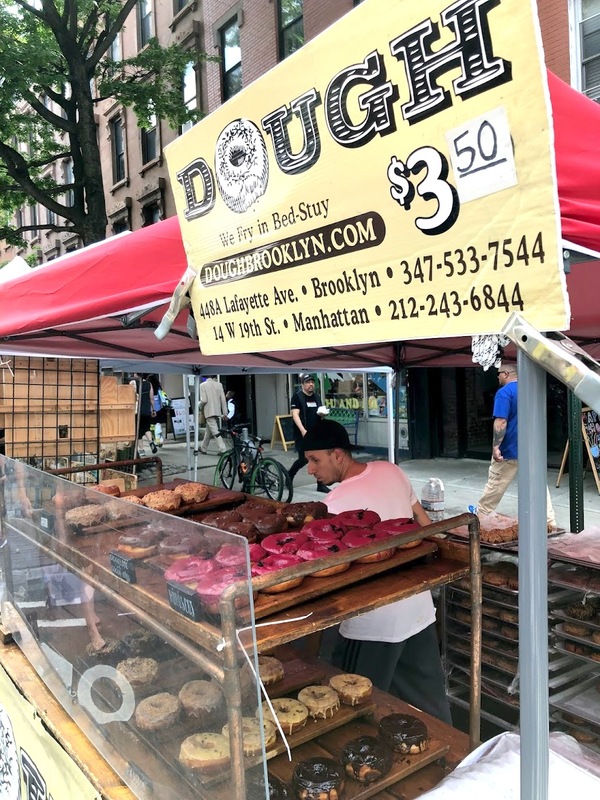 My most favorite donut in NYC. Hands down. I love walking into Goorin Brothers. I think we're doing summer now. Like, I don't know if we're going to have a spring? Maybe next week. That's how these weather patterns have been playing me recently. But, you know, we can roll with this. Don't ever let me complain about the heat again, ok? After this past winter I must learn to appreciate the warmer weather even more than I used to. In celebration of our latest wave of "sprummer" (get it - spring and summer?) let's pull on a dress - or shorts, if you like - and make sure that we have some zucchini rice. Zucchini season is in full swing so we need to take advantage. Get thee to your local markets immediately. Once you're back, we can discuss this rice situation. We are mixing zucchini for our health and cheese because we only live once. And let me tell you that this is delicious. I decided to use brown rice because I had some in my pantry, but you can do you and use whatever type of rice you have. Live your best life! 1) Over medium high heat, melt the butter in a large saucepan. 2) Add in the garlic and stir. Allow to simmer for 1-2 minutes in the pan. 3) Pour in the chicken broth and water, then add the rice. Bring the rice to a boil, cover, reduce the heat, and simmer until the rice is cooked through. This can take about 12 - 15 minutes. 4) Remove the saucepan from the heat and stir in the shredded zucchini and cheese. 5) Season the rice with salt and pepper, to taste. Cover the saucepan and allow the rice to stand for 3 minutes, so the cheese can melt. Serve immediately. *Note - you can leave out the water and use only broth if you like. Similarly, you can substitute water only, if you don't want to use broth. The Brunch Dish is here once again! This time we're talking about Lilly's Craft & Kitchen in Hell's Kitchen, NYC. I confess that I have actually been here twice in the last few months. The first time I was hanging out with my friends and their two adorable kids, so suffice it to say that while the pictures I took were cute, there was also a lot of other stuff going on. Kids do not care if you want to take a photo of food! The second time I visited Lilly's, I was with a friend and we sat at the front window - prime location for people-watching! 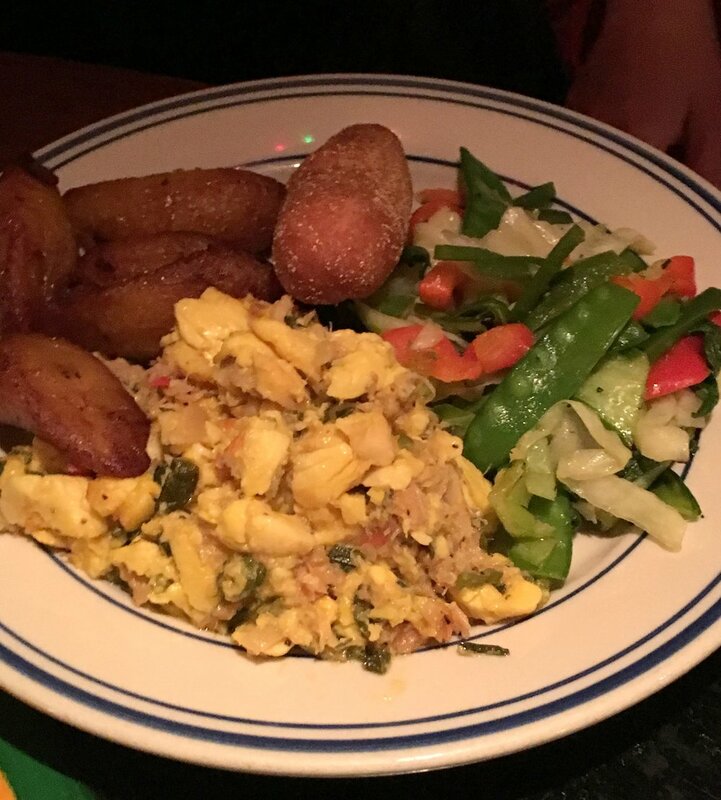 We grabbed the menus and saw that the brunch primarily consisted of quite a few egg dishes and burgers. But don't worry! They do have classic breakfast/brunch dishes such as pancakes and french toast. There are also several weekend specials which they swap in and out. Have I mentioned that Lilly's also has an unlimited drink menu!?!?! For $24, you can have unlimited Mimosas, Bellinis, or Bloody Mary's for 90 minutes with the purchase of a brunch entree. This is a great deal if you plant to have 3 or more beverages over the course of brunch, as just one of these drinks is ~$8. When I visited Lilly's, I was actually pretty tired so I opted for a coffee and a glass of wine. My friend decided to take advantage of the Bellini drink special though! My friend's food arrived first (there was actually a glitch and my food was delivered to another table!). She ordered the Lilly's Signature Burger which also comes with fries on the side. It looked delicious and she enjoyed it as well! I opted for the Breakfast Quesadilla. When I finally received it, it was fabulous! The portion size wasn't too large and I really enjoyed the side of chips and salsa to nosh on. I will say that I highly recommend the brunch at Lilly's Craft & Kitchen. Even though they sort of forgot to give me my order the second time I visited, everyone was really nice and tried their best to fix the issue once they realized it. I would also venture to say that this is a favorable location to bring kids to brunch if it's earlier in the day. They open at 11am on weekends and it wasn't too crowded at the opening hour. It gets busier in the afternoon, so it will be more adult-friendly later on. 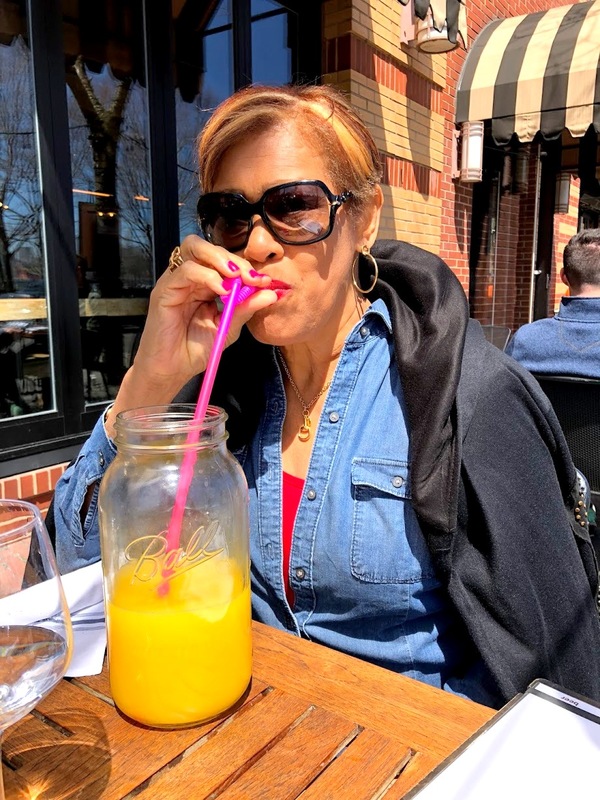 Either way, I have enjoyed my experiences here and I would definitely recommend Lillys' Craft Bar & Kitchen to anyone who might be in the Hell's Kitchen area for a weekend brunch. OK, stay with me. I know it might seem a bit strange to combine Brussels sprouts and pizza. But there's bacon, so everything will be alright. Speaking of being alright. It's SPRING! Granted, we're only on Day 2 of Spring, and tomorrow we're reverting back to winter....but we're living for the here and now, right? I went out last night for a late dinner with a friend and we celebrated by walking over to the restaurant without the painful feeling of a brutal wind on our face. 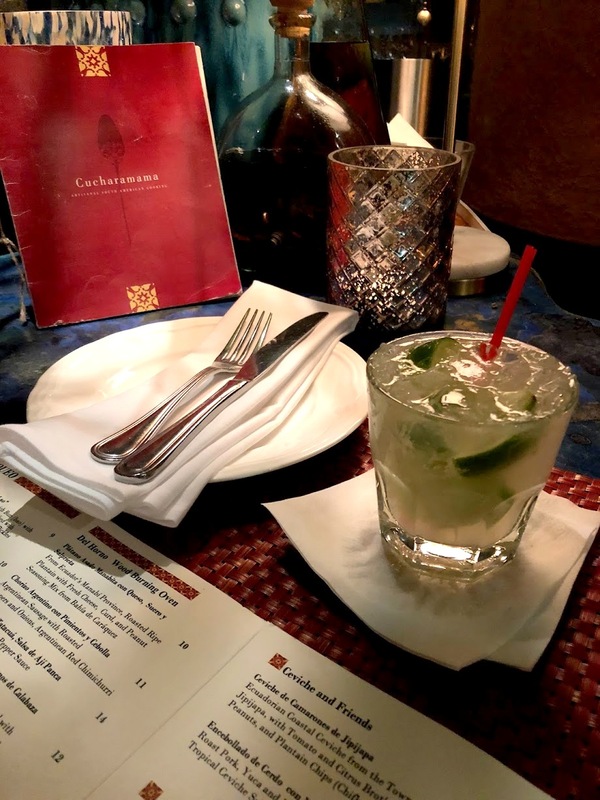 Then we had pineapple jalapeno mojitos and Cuban food, which was divine! Today I'm actually going to workout for a bit indoors. I'm not super happy about it, but the tostones and yellow rice and peas from last night are not going to work themselves off. Until my class starts, I plan to don my athleisure-wear, walk around in the sun with an iced coffee and try to be as basic as possible. 1) Preheat the oven to 425 degrees F.
2) Spray a lined baking sheet with cooking spray. Place the Brussels sprouts on a pan in a single layer. Drizzle with olive oil, salt and pepper, to taste. 3) On another lined baking sheet, spread out the bacon slices. 3) Place both baking sheets in the oven. Roast the Brussels sprouts for 10 minutes. The bacon should be done after 10 minutes, but if you like really crispy bacon, allow them to bake for a few more minutes. 4) Remove the bacon from the oven and chop into bite-sized pieces. Set aside. 5) Roll out the pizza dough and stretch it to fit on a sheet pan. 6) Top the pizza dough with the Brussels sprouts, then the crumbled bacon, and then the manchego cheese. Sprinkle the herbs and spices on top. 7) Bake the pizza for 10-13 minutes, or until the cheese is bubbly and the dough has taken on a golden brown color. 8) Slice and serve immediately. If you know me, then you know that I'm obsessed with France - Paris specifically. So going to Paname Restaurant was a great experience for me. Paname is the slang word for Paris, similar to how The Big Apple is slang for New York City. I've never heard of that before and it was an interesting fact. I was excited to get the opportunity to check out Paname and the lovely menu. Chef Bernard Ros opened Paname in November 2014. He is the owner, executive chef, pastry chef, and wine director! Paname features an eclectic selection of updated classic French bistro dishes with a modern flair. They are open every night for dinner, weekday lunch, weekend brunch, and an all day happy hour 12-7. They don't offer delivery, but they do offer onsite and offsite catering. Paname is located in Upper East Side in New York City, on 2nd Avenue between 56 and 57th streets. Upon walking into the restaurant, I entered an intimate space which was decorated eclectically with Art Nouveau decor. There are framed Parisian Art Nouveau paintings, classic wood bistro chairs, and wooden tables with crisp tablecloths. The dining room seats 60 people and I'm pleased to say that you don't feel as if you're crammed into the space, as you may feel in other NY restaurants. As we are approaching May and Mother's Day, you should be aware that Paname is planning to have a Mother's Day special menu with 3 courses for $40. The menu can be found here. So if you're wondering where to take your mom for her upcoming special day, here's your answer! But don't forget about the regular menu too - see below! We started off with a plate of Amuse Bouche, which are little bite-sized hors d'oeuvres that Chef Bernard sometimes serves in between courses. They aren't available on the menu, as Chef Bernard creates a variety of these on an ad hoc basis. This amuse bouche platter consisted of a sardine pastry bite, a mushroom bite, and a cracker spread with a bit of Roquefort cheese. For an appetizer, we decided to order the Baby Octopus with White Beans. I will confess that I'd never had octopus before but I decided to change that once and for all. The octopus was very tender and the sauce was rich and savory. I'm usually not a fan of beans, but the white beans were delicious as well. I would definitely recommend this dish as a unique appetizer. For our first entree, we started off with a Bouillabaisse with Shrimp, Cod, Clams, and Mussels. This broth was very tasty and rich. We were also given bread as well and I really enjoyed dipping my bread to absorb the sauce. This bouillabaisse takes about 2-3 days to make. It takes a whole day to reduce the broth to get to this level of richness. If you're interested in a tasty, robust dish, then this is the one for you. Our next entree was the Oven-Roasted Duck with Barley and Mango Coulis. This duck was so tender and moist that we could "cut" it with a fork. It was served with a sweet mango sauce on the side. Chef Bernard mentioned that the duck is cooked over the course of 3.5 hours! Our final entree was the Beef Bourguignon. This is actually not on the written menu, but it is available every day. Many places that serve beef bourguignon only serve it one day a week because it takes so long to make, but you don't have to worry about that at Paname! This dish is made over the course of 2-3 days, so it's also rich and the meat is tender and falling apart. The beef is served over mashed potatoes which soak up the stew to round out a delicious meal. Paname serves a variety of homemade and unique ice creams. The night we went, we were treated to homemade rose ice cream. I adore rose scents and flavors, so I found this quite delightful. Chef Bernard will change up the flavors over time, so you might not get the same ice cream twice! For dessert, we chose a few items. We had the classic Creme Brulee which was a sweet and crunchy treat. We also tried a molten chocolate volcano cake. The cake was made of decadent chocolate, with a liquid chocolate in the center. It was fabulous! And look at that presentation! Finally, we tried the Apple Tart, as the French are known for their ability to make amazing tarts. This was no exception. The pastry was crisp and flaky and topped with a dollop of sweet vanilla ice cream for contrast. To get a rare taste of true Parisian food in the middle of NYC, I would recommend visiting Paname to check out the French fare. 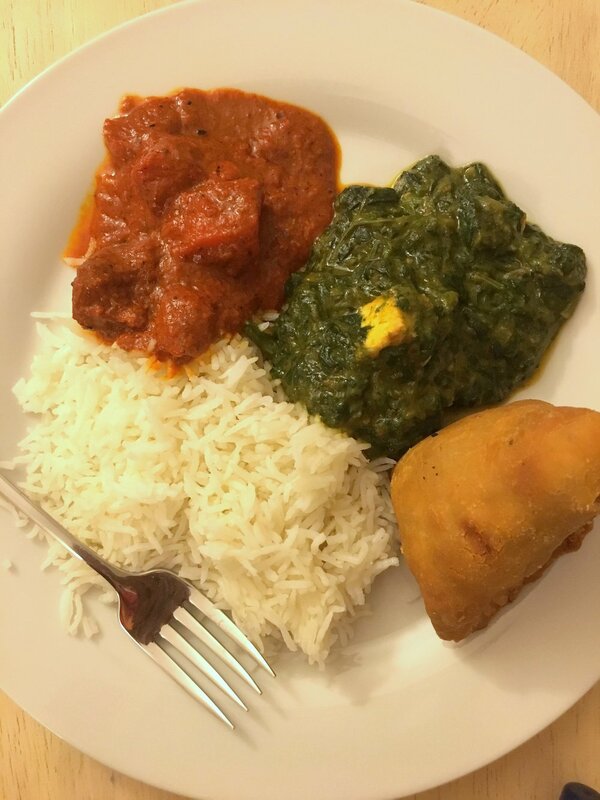 I had an excellent dinner and I would truly go back again to try all the other dishes and sauces that I didn't taste on this visit. *Disclaimer - I was provided with this meal in exchange for my opinion. All opinions above are my own. I like winter. I really do. But I'm SO READY for summer! I just can't deal with these continuous Nor'Easters, or even just the cold weather in general. After a few days of being in New Orleans and wishing it was warmer there, I returned to the NY area and was immediately smacked with cold wind to the face. Note to self - Appreciate the warmth when you have it! This cold is driving me to continue to cook warm and hearty food. I know I should be living for salads at some point but I just can't bring myself to eat only greens just yet. I'm still here for my slow cooker, saucy, carb-loaded meals. It still feels like winter outside, right? So why not? I've had this cheeseburger gnocchi recipe on my radar since last winter. It's honestly been that long but I'm nothing if not committed to food. I finally got a chance to make this recently and it was basically one of the best decisions I've made in 2018. Pats self on the back. If you want to live your best life, I suggest you also get into this. 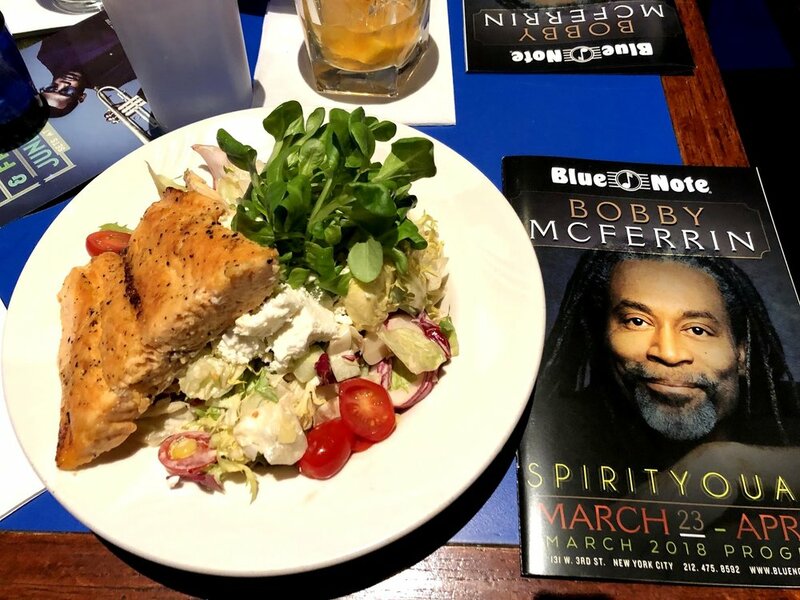 You can eat a salad tomorrow. 1) Melt the butter in a large skillet over medium-high heat. Add the gnocchi in a single layer and cook until browned and toasted on one side. Shake the pan to move the gnocchi around and brown the other side of the gnocchi for 2-3 minutes. Note that you may need to do this in batches and you may need to use tongs to help you turn the gnocchi. Move the pasta to a plate and set aside. 2) Turn the heat to high and drizzle the extra virgin olive oil to the pan. Add the beef to the pan and then pour in the salt, pepper, cumin, paprika, mustard powder, and red pepper flakes. 3) Toss in the onion and garlic. Stir until the beef is browned, the seasonings are incorporated and the onions are golden. Drain any excess fat in the pan. 4) Pour tomatoes and broth or water back into the pan. Add in the toasted gnocchi and stir everything together. 5) Bring the mixture to a boil, cover, and reduce the heat to medium low. Allow the gnocchi to simmer for 5 minutes, or until the gnocchi is softened and the liquid in the pan is mostly absorbed. 6) Remove the pan from the heat and stir in the cream and 1/2 cup of cheese. Sprinkle the remaining cheese and the scallions on top of the gnocchi dish. Cover the pan for 5 minutes to allow the cheese to melt. Serve warm! Hey hey! I'm back again with more photos for ya. I actually just got back from another successful trip to New Orleans! I considered doing an updated post to my 2013 NOLA post, but I'm not sure yet. So many post ideas and so little time! While i think about this, here's my photo dump from the past month. Enjoy! The walk home from work the other day - The Helmsley Building all lit up in blue and green! 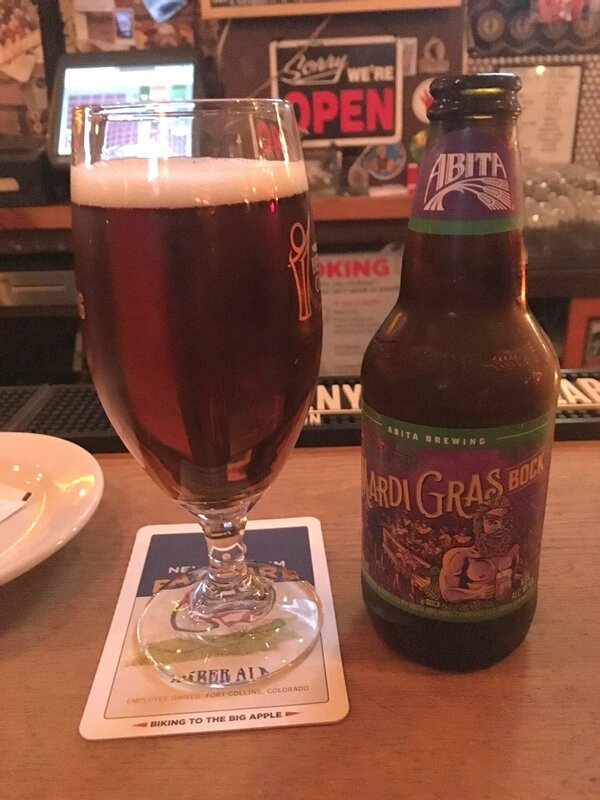 It wasn't Mardi Gras, but I still quite enjoyed a Mardi Gras Bock. The beer fridges at Beer Culture are out of this world! I haven't had these curry fries in a minute. I didn't have the patience to make the sauce to go along with it, but these will do juuust fine, thank you. I also remade this kale salad and I really prefer this type of kale vs the kind I used in my actual blog post. This type of kale is just crunchier and sturdier, if that makes sense. It can handle the dressing a lot better. Anyhow, the point is that I must remember to update that post and the pics. 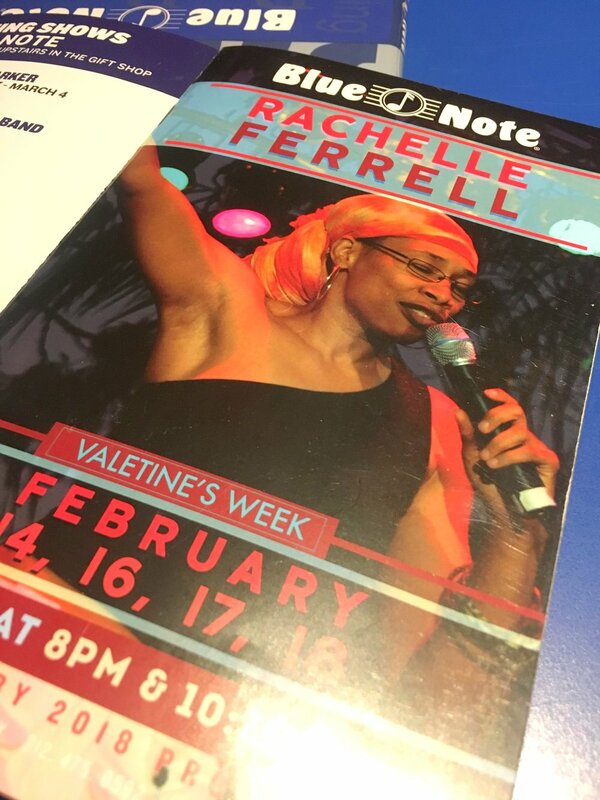 Went to see Rachelle Ferrell at the Blue Note for Valentine's Day. It was magical! Fish soup! My cooking class team didn't make this, but the arrangement of the bowls really pleased me. Pizza for brunch at BIN14 in Hoboken. Late Sunday night jazz jam in Brooklyn. Had brunch with my college friends and their older kid brought her stuffed monkey. Monkey and mimosa. Our friend Montaya performed at Apollo's Amateur Night. I'd never been before and it was amazing! Dinner and girltime catchup at Antique Bar & Bakery. This place is quirky and if you go on a Friday night, there's a DJ, a go-go dancer, and donuts! 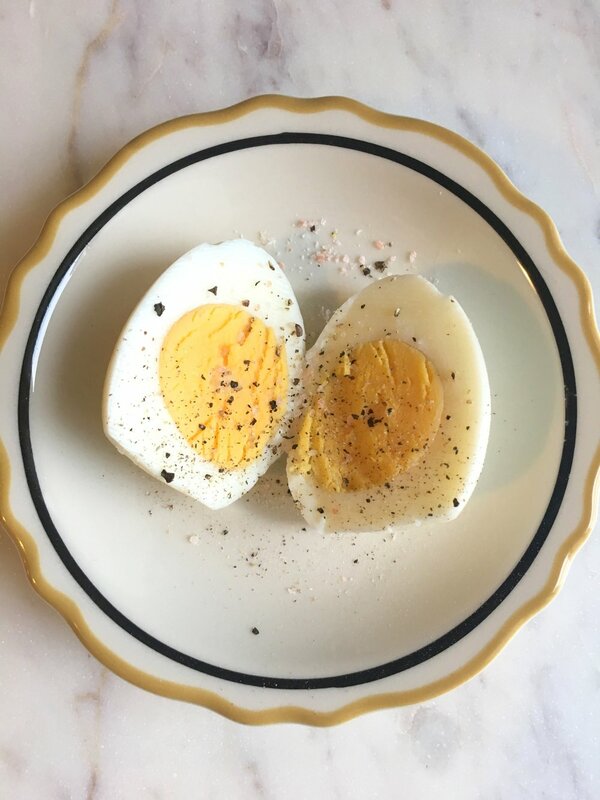 Really having a moment with hard-boiled eggs lately. Freshly cracked pink salt and pepper for the win! I know you've missed the sunset pics ya'll.